Coconut Grove, or simply "The Grove," as locals know it, is one of the oldest, most beloved areas of Miami. Full of lush foliage and charming shops and restaurants, Coconut Grove embodies the epitome of a tropical paradise. This laidback coastal neighborhood feels worlds away from the hustle and bustle of Miami, despite the fact that it lies in the heart of this popular Florida city. 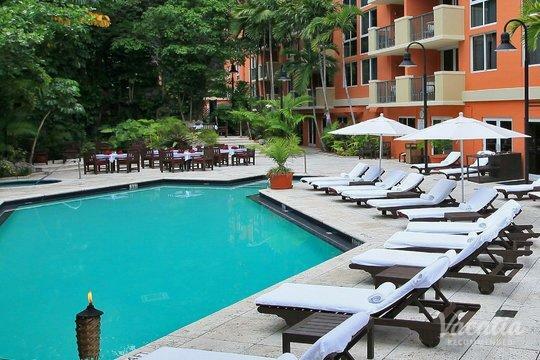 So if you want to find your own beachside oasis in the heart of Miami, work with Vacatia to book your stay at one of the best Coconut Grove resorts available. This quaint, serene neighborhood will steal your heart the moment you arrive, and it's sure to quickly become one of your favorite vacation spots in the world. Whether you are planning a fun family getaway or a romantic vacation with your significant other, Coconut Grove is the perfect place to visit. To ensure that your time in Miami is unforgettable, work with Vacatia to find one of the best Coconut Grove rentals available. When you let Vacatia help plan your vacations, you can always rest assured that you'll have a spacious, comfortable home away from home wherever you go. Forget the stresses of the city and of everyday life and escape to beautiful Coconut Grove, Miami, where the sun shines year-round and the natural beauty seems to never end. The relaxed, Bohemian vibe of Coconut Grove will put you instantly at ease, so you can enjoy every moment of your Miami vacation. To make the most of your time in Miami, work with Vacatia to find the perfect vacation rental for your stay. When you stay at a Vacatia rental property, you will be able to enjoy the best of home and the best of vacation, because every Vacatia rental property features the added space and comfort of a home. So if you book your stay at one of Vacatia's Coconut Grove resort hotels, you will have your own fully equipped kitchen as well as the desirable amenities and services of a resort. There's no better way to experience this tropical paradise than by staying at a comfortable, luxurious Vacatia resort. Coconut Grove is the oldest neighborhood of Miami, with roots dating all the way back to 1873. While this neighborhood lies in the middle of the city, it has the vibe of a serene tropical oasis, where you can bask in the sunshine and stroll along quaint streets. The Grove is known for its lush vegetation and its idyllic bay, and it's the perfect place to escape the bustle of the city. This historic neighborhood has a distinctive Bahamian flair that will make you feel as if you've found your own personal paradise, and you're sure to love every second of your stay in Coconut Grove when you book your accommodations through Vacatia. You could have your own home away from home in this charming, bohemian neighborhood thanks to Vacatia, so your Miami getaway is sure to be one you'll never forget.